What is akagai (surf clam)? Akagai goes by many names, including surf clam, red clam, or ark shell clam. It is often presented in a beautiful flower pattern, placed so that the white base flows into the bright red tips. This dish has a mild aroma and taste which slowly becomes more prominent as it is chewed. The flesh is soft and firm, and should be enjoyed slowly to allow the sweet flavors and aromas to be released during consumption. Akagai can be served as sashimi, however it is often cooked as many find the flavors of the dish to be underwhelming. Common cooking methods include boiling and sautéing in butter. This is especially true for southern surf clams, which have cream colored shells and a softer taste. The higher quality northern surf clam, which has a distinct black shell and a sweeter taste, is often consumed raw. 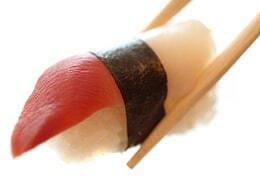 The northern surf is thus preferred in sushi restaurants. Akagai have a year round fishing season, starting January of the calendar year. The best season to enjoy this dish is in April or May. The preparation of surf clam for sushi is an interesting process. First, the clam is placed in sea water, which allows any remaining sand to be expelled. It is then shucked, yielding about two thirds of the meat for consumption. The rest of the innards including the valves and connector muscles are discarded. If you are in a fancier sushi restaurant, it will then be plunged in cold water, butterflied, and served. In other cases, it will be lightly simmered which brings out the bright redness of the tips as well as the sweet flavors. The highest quality surf clams are deep harvested 125-190 miles (200-300 km) offshore in the North Atlantic waters, which are mostly untarnished by pollution. These waters are full of nutrients and very cold, contributing to the delicate, sweet tastes of surf clams. Atlantic surf clams hold a rating of good choice on Seafood Watch, meaning that this ingredient is a good choice for those who are concerned with the sustainability of their sushi. Nutritionally speaking, akagai, Surf Clams, are high in iron and omega 3 fatty acids. 100 grams of the dish will include 60 calories along with 18 grams of protein. Arctic Surf Clams are a great low fat, high protein choice – as long as you aren’t drowning them in butter! Surf clams, when presented properly, are a beautiful and delicious dish which is to be enjoyed slowly and thoroughly. While the clam is often simmered in butter, the highest quality northern clams should be enjoyed raw, allowing the aromas and flavors to stand on their own.